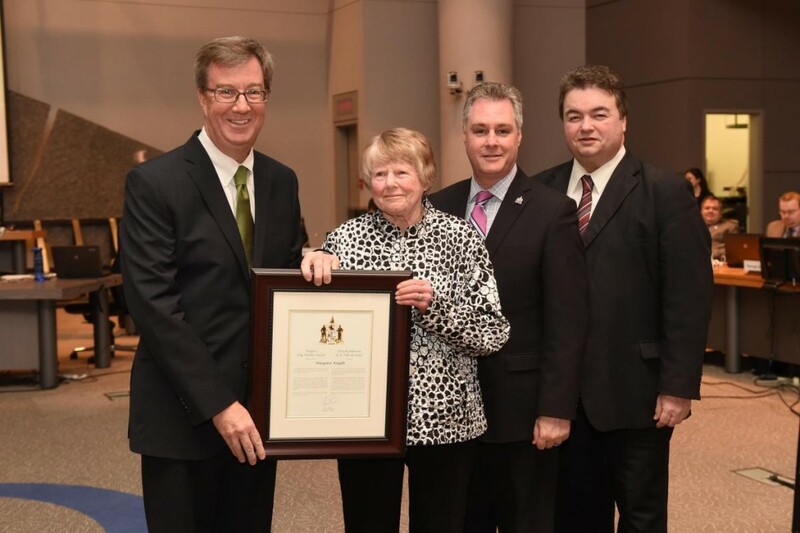 Mayor Jim Watson and Councillors Rick Chiarelli and Mark Taylor presented the Mayor’s City Builder Award to Margaret Knight today in recognition of more than 35 years of running free breakfast and lunch programs at the Foster Farm Community Centre, as well as volunteering with several other community charitable organizations. Often long before sunrise, five days a week Mrs. Knight is at Foster Farm’s kitchen preparing breakfast for 40 to 45 children and planning two lunches weekly for about 35 adults. Her breakfasts give the children a nourishing, filling start to their day, and her lunches aren’t a simple soup and sandwich – she prepares full meals like turkey or chicken dinners, homemade lasagna and shepherd’s pie, all with vegetables and dessert. If the available funds on any given day don’t stretch far enough, she often buys additional supplies with her own money. And her generosity doesn’t stop when she leaves Foster Farm. She’s also an enthusiastic volunteer at the Britannia Woods, Morrison Gardens and Starwood nursing homes and St. Vincent’s Hospital. She assists physically challenged members of the community to get to church on Sundays; she prepares Christmas hampers; and on Fridays, she delivers Meals on Wheels. The residents who nominated Mrs. Knight say her welcoming and caring nature contribute at least as much to the community as her volunteer work. She not only provides meals, she provides companionship. She loves to introduce people who are alone to others, and she creates a positive atmosphere of sharing and encouragement.